The foundation of a great linen table setting is high quality textiles with exceptional finish. Our table setting linens: tablecloths, napkins and bread baskets, provide a naturally authentic foundation. Using CROP linens and a combination of elemental well crafted items combined with flowers and plants, you can create a beautifully elegant table for your formal or casual meals. As in a French home, you may choose to serve your guests single dishes over multiple courses. Or maybe, like in Greek or Chinese homes, serve a cornucopia of color and variety in the form of small plates and vessels where each diner combines them to their own personal preference. In all cases, the main philosophy is to keep the table setting simple but elemental and bring life to your table with seasonal plants and well chosen flowers. You may wonder what we mean when we say “elemental”. We mean made from primary materials like flax, earth, wood, steel or copper. Items like flowers or plants. Materials that embody nature in a way that our humanity can sense their origin. Items that lack the extra technological layers that separate the objects from our senses. Textiles soften a table setting, they add elegance and warmth. For a full meal, I use a tablecloth with matching napkins as the foundation setting. 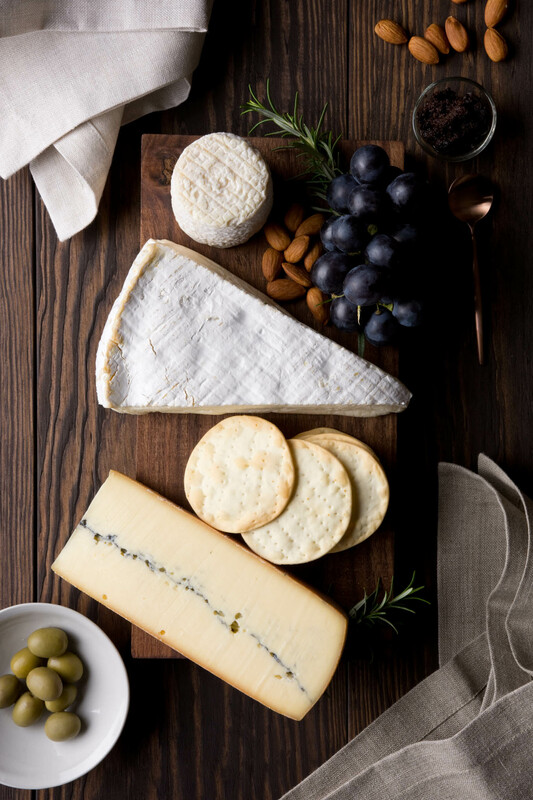 For a casual meal or apéro, a.k.a evening drinks, I serve directly on the wooden table but I use the napkins and bread baskets not only for practical reasons but also to bring their softness and texture to the table. For meals like these I do not always use matching napkins. I find that mixing the two CROP linen tones is a lovely point of difference. The natural appearance of our linens means they can be used in a simple display of elegance with the bare minimum of items on the table top and are also perfectly at home in an abundantly rich and heavily dressed table. Their natural texture and inherent lustre provide the most suitable backdrop to other elemental materials: hand thrown ceramic plates and bowls, copper cutlery, blown glass, serving boards, flowers and foliage, to describe a few. Natural colours like soft pinks and greens, earth reds, the cloudy misty clay tones, foliage green and nearly all pastel hues are most suited to the natural tones of our linens. My subjective choices are the blue-greens of the gum tree leaves and the dusty pinks and crimsons of its blossoms. We offer four standard size tablecloths in two colours: “flax” which is the inherent color of flax and a lighter tone which we call “natural“. I use a standard drop of 25 cm (finished) from the table top on each side. Sometimes your table dimensions or how you want the tablecloth to drape means that you will need a tablecloth made to order. A longer drop suits a more formal occasion and a shorter drop is for casual, everyday luxury. I am absolutely happy to construct to your specifications. The price of the tablecloth will be determined by the amount of fabric used with no additional fees for it being a custom item. Our philosophy is that we treat every single item as a custom item. We offer our napkins and bread baskets in both “flax” and “natural” tones. Our napkins come in 50 x 50cm (20 x 20 inches) finished but custom sizes are also possible. We like this size as it is generous without becoming difficult to handle. Our bread baskets come in two sizes: small & large. The small bread baskets can contain about 4-6 dinner rolls. If you want to serve a whole sliced loaf, the large bread basket will be more suitable. When choosing items for serving, eating and drinking I always gravitate towards those made from a natural material and those made by hand take priority. Both of these qualities bring value and provenance to the items. Seeing or knowing the hand of the maker is one of the most delightful aspects of hand made homewares. Simply being able to identify that an item is made by hand has its own allure, that someone somewhere forged it with great skill by hand and a personal process. The materials themselves have their own story too of course. Some makers produce their ceramic wares from the clay in their own backyard, or the stream in their village. Some use earth from an age-old quarry in Italy that potters have used for millennia. All materials have a story to tell and all infuse meaning into the item. Some people like their forms to be wobbly or misshapen with an exaggerated hand-made aesthetic where as others prefer them to be precise and perfectly glazed with little variation. Whatever your inclination, choosing items that have meaning to you will ensure that you have a long-lasting, enriched collection of items with which to dress your table. If it is your first foray into table dressing, consider how and what you eat and then define some basic forms for use. A salad bowl, four dinner plates, a small curved edge plate for dips, spreads or butter, a small salt bowl and a carafe for water. We love to use wooden boards and have a range of shapes and sizes on hand. A large round board for bread or pizza. A small round board for cheese. A long plank that travels end to end of the table that can be used for apéro, covered in cheese, water-crackers, cold meats, garlic pizza, melon, grapes and tapenade. Cutlery is generally made from metals, commonly stainless steel. It is simply easier to look after and really does last and last. Unless you are willing or able to choose solid gold, rose gold or silver cutlery, plating is the way to go. I lean towards copper and rose gold colourings because of their warmth and how they subtly contrast green toned ceramics and foliage. But dark, hammered or maybe brushed stainless steel looks fabulous also. 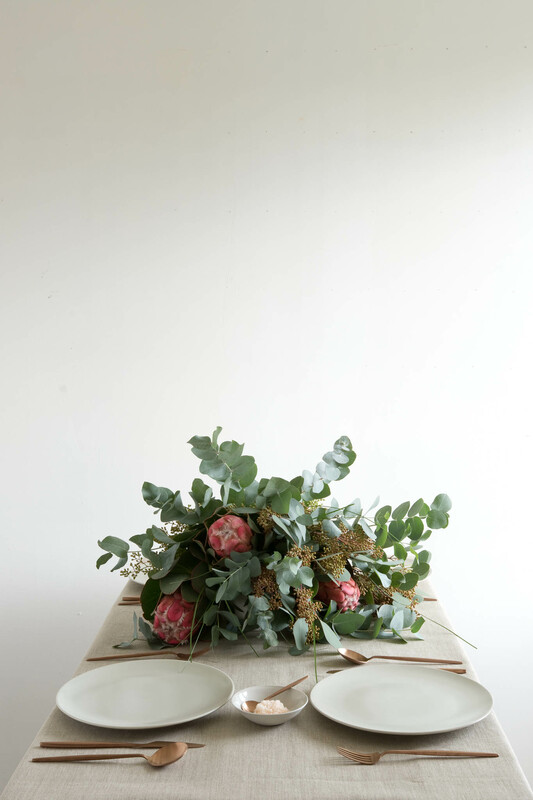 Choosing flowers to dress a table is a grand opportunity to improvise. Ideally, a well planned garden will give a constant supply of seasonal flowers and foliage but foraging can provide surprising results. Even dried summer grains and grasses can be used to create a dramatic display. Depending on the table space available, one may choose to have an opulent, centre placed plenitude of wild flowers and foliage or even small delicately placed bunches of herbs or spice plant foliage to add extra aroma to the meal. Or, one may simply wend & wind a vine, a cutting from an abundant climbing rose for example, amongst the multiple plates. The key aspects to keep in mind are to not block visual contact between diners, so no trees or small bushes, and to be mindful of scent. Some people can find certain floral scents overwhelming while eating so choose plants and flowers for their scent-free aesthetic beauty or simply, like a good wine, pair your flowers and plants to the meal. Many flowers are in fact edible.